What Will the WWE Title Picture Look Like Going Into WrestleMania 29? With the 2013 Royal Rumble approaching quickly, ratings pretty much in the dumps, and a ton of scenarios that could lead into WWE’s biggest show of the year, today I’m taking a look at what the possibilities are for the WWE Championship at WrestleMania 29. Usually around this time every year, it’s pretty clear what the title match at WrestleMania will be. This year is a different story as there is so much going on with so many different talents, it’s hard to say where things will end up. For starters, we have the longest reigning champion in years in CM Punk. Not since the 80’s has a champion reigned for over a year, which will obviously make any kind of title change mean more if it were to happen. For the past year, the common thought has been that The Rock was coming in at the Royal Rumble and winning the title for his “one more time” championship run regardless of who it was against. That may very well still be the case, as Rock beating Punk for the belt would definitely create some buzz especially since The Rock is such a mainstream star now. If the Rock DOES win the title, it will definitely point towards Rock vs. Cena 2 at WrestleMania 29. The question is, do people WANT to see that match again? The Rock defeated John Cena cleanly at WrestleMania 28, everyone was happy, and the “Once in a Lifetime” concept worked just fine. Does anyone really want to see Cena get his win back, thus earning The Rock’s respect? I don’t. What about a Punk vs. Rock rematch? I’m not very interested in that either. Rock vs. Punk on the mic alone will be great, but their Rumble match should get the job done on that story in my eyes. Then there’s the idea that this year’s breakout star that made that made a huge impact on the WWE scene could be involved in the title picture – that man is Ryback. 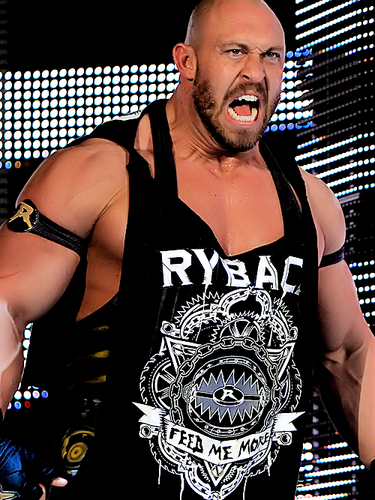 Ryback burst onto the WWE scene this year and was in the WWE title hunt after just a few short months. CM Punk has escaped 2 encounters with Ryback already, but Ryback’s momentum has sustained and it’s only a matter of time before fans demand Ryback get a fair shake at the belt. A Ryback vs. Punk match wouldn’t carry much of a WrestleMania feel since the match has happened a couple of times, and could possibly happen again this Monday. Could WWE shake everything up Monday and have Ryback beat Punk? Or will they risk him walking away without the belt once again. Then there’s the off chance WWE could go with Ryback vs. The Rock if either man wins the belt before WrestleMania. There is definite intrigue there, but coming up with a finish for that one could be tricky. Ryback vs. Cena is another possibility that would split the crowd and make for a hot title match, but would strand Rock and Punk in non-title matches. WrestleMania 29 is shaping up to be a star studded event with a ton of possibilities. The Undertaker’s streak will most likely be on the line again against whoever he chooses, Brock Lesnar is still under contract to WWE, Triple H can always throw the tights back on, and even Steve Austin has stated he is open to another match under the right circumstances. With so many talent possibilities on the show, the actual WWE Title match they go with will hopefully be something that feels WrestleMania worthy. There is always the chance WWE could get really crazy and shake things up using Dolph Ziggler’s Money in the Bank briefcase in the mix, but these 4 guys are who I see as possible WWE Title match guys this year. Which WWE Title match do you really want to see at WrestleMania 29?